Stroke. Computed tomography (CT) scan of an axial section through the head of a 29-year-old patient with a stroke. The front of the brain (grey) is at the top and the right hemisphere is seen on the left as the scan is from below. A stroke is the death of brain tissue caused by a lack of blood flow resulting from a head injury, high blood pressure or an embolism. 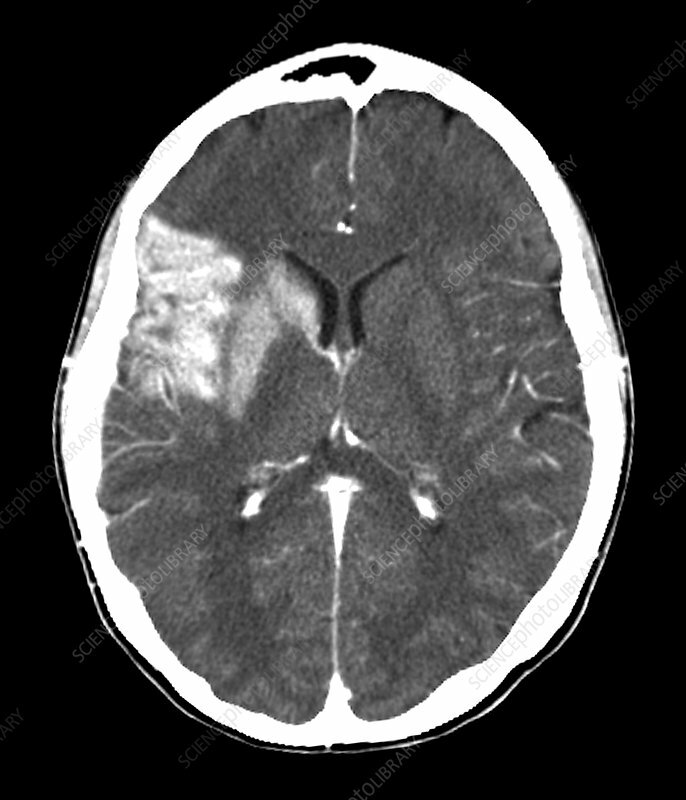 In this case, a ruptured blood vessel has led to an area of bleeding (white patch) around the Sylvian fissure in the right hemisphere of the brain. The Sylvian fissure is associated with language and speech, so this stroke may cause speech disturbances. Treatment can involve removing the clotted blood and taking drugs to reduce blood pressure or to thin the blood.